These are the real race cars, the race cars converted to street use or street cars built into race cars. These are the real beasts of the auto world. This is one wild street machine that use to tear it up on the track. If you ever had dreams of cruising down the boulevard in one wild race car, you have to read this page, watch the video and study the photos. This is a real Benny Parson’s race car. 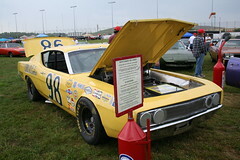 It has, as most race cars, been re-skinned a few times. This is one great piece of history that is not afraid to be touched and used. Make sure you watch the video and hear the big 427 run. This Talladega is like no other. 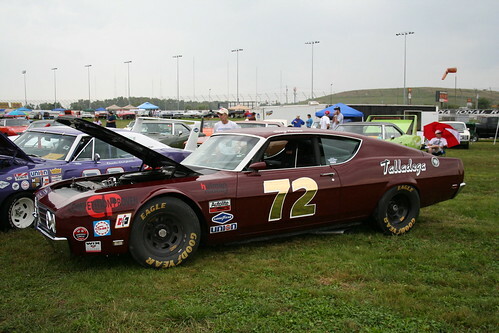 It is street legal and powered by a Boss 429 and built for the track. 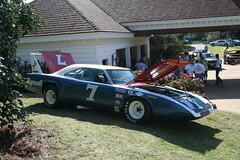 It is a tribute to NASCAR legend Benny Parsons. A video is included. This feature car is the very famous So-Cal Speed Shop’s Belly Tanker. You are going to see it like you have never seen it before, naked.